Durable and simple to maintain, this 20-piece silverware set is ideal for the daily rigors of your kitchen. The forks, spoons and knives are ergonomically crafted for a comfortable dining experience. – Smoothened edges and ergonomic handles. – Complete silverware set for full service. – Frosted look with simple detailing. – Dishwasher safe for hassle-free cleaning. Our silverware are crafted from good quality 18/0 stainless steel; You’ll never have to worry about the knives struggling to cut, the spoons bending as you chow away, or the prongs of the forks curling out of shape like others do. Make your dining table stand out with a silverware set that is eye-catching without being visually overpowering. 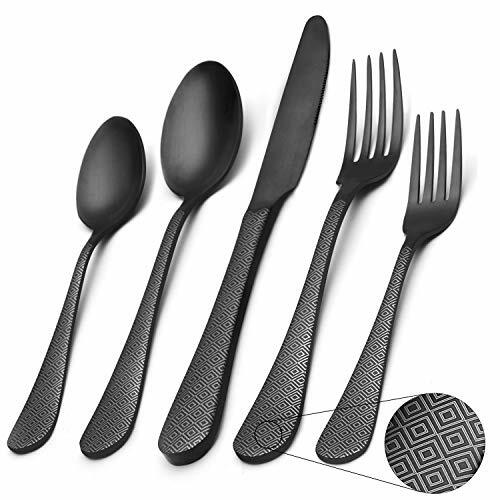 Black design and neat pattern handles make these silverware set easy to integrate into any environment. and with the unique silverware set being dishwasher safe, clean-up will be a breeze! SHARECOOK stainless steel silverware set treats you to impressive durability, eye-catching aesthetics, and convenient functionality. Not what I expected I guess I didnât look at the picture hard enough. I was expecting/wanted plain black matte silverware. This has a silver diamond pattern (close up for anyone else that may miss it like I did). Itâs not bad but itâs not what I want. Silverware seems to be good quality but I will likely be returning it. look so posh on the table Have white square embellished Corele dishes because my arthritic hands could not longer handle my favorite dishes, so I wanted to have something fancy looking to enhance them. This silverware is very unique and looks really rich next to the dishes. I ordered 2 sets and am so please with the weight, feel, and look of them.